Message hasn’t changed: pollution violations are still rampant. Latest report looks at dyeing and finishing. With the launch of the new Phase III textile pollution report from Green Choice Alliance (GCA) through the Institute of Environment & Public Affairs (IPE) we take a look at the winners and sinners and how they faired since the beginning of the investigation in April 2012. See our articles on the first and second report here & here. The message hasn’t changed from the two previous reports: pollution violations are still rampant. This time, the focus is on dyeing and finishing causing significant water pollution. 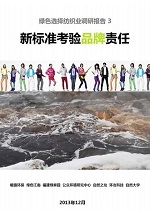 The seven China NGOs urge brands to do more about it and soon. Ma Jun, Director of IPE, is quoted in the report saying “China’s printing and dyeing industry plays a decisive role in the global textile industry. When a large number of dye houses violate discharge standards, not only will it pollute the local environment, it also means there is a high risk of environmental violations in the supply chains of major textile brands”. 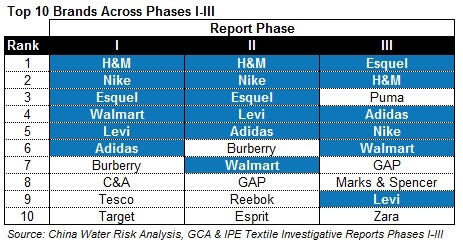 Adidas, Esquel, H&M, Levi, Nike and Walmart have been in the top 10 across Phases I-III. The report said these brands (excluding Nike and Walmart) actively review their supply chains using public data on their suppliers to identify and mitigate high pollutant points. Adidas, H&M and Nike are three of the four leading brands that led the charge in 2011, launching the ‘Joint Roadmap to Zero Discharge of Hazardous Chemicals’. The roadmap aims to eliminate discharge of all hazardous chemicals across entire supply chains and product life-cycles by 2020. (We covered this in Can Fashion be Green) Surprisingly, despite this commitment only H&M has a corporate water strategy. Puma, the fourth brand part of Zero Discharge Roadmap, is one amongst the most improved (see below). Somewhat surprising are the brands at the bottom. These include some big names: Polo Ralph Lauren, Uniqlo, Tommy Hilfiger and Abercrombie & Fitch. The report also says these brands, as well as Calvin Klein and Target, continue to adopt a passive or evasive approach to their supply chain. “… Polo Ralph Lauren, Uniqlo, Tommy Hilfiger and Abercrombie & Fitch. We note that some of these brands actions or lack of, do not match their pledges. To date eighteen global fashion leaders, including Uniqlo, have committed to Greenpeace’s Detox campaign. However, Uniqlo has yet to acknowledge or respond to the China NGOs. Further contradictions are apparent with Abercrombie & Fitch and Victoria’s Secret who have built their brand images on clean and social values, yet are repeat violators. Where is their Corporate Conscience? Both brands are expanding in China. Surely when 40% of Chinese surveyed by Pew Research Centre believe that water is a “very big problem”, it makes sense to focus on cleaning up when expanding in the Chinese market. Separately, we note that several large stores: Macy’s, J.C. Penny and Carrefour are amongst the poor performers since April 2012. Should they be doing more to police the brands they stock? These share the bottom ranks with high end brands like DKNY and Polo Ralph Lauren. 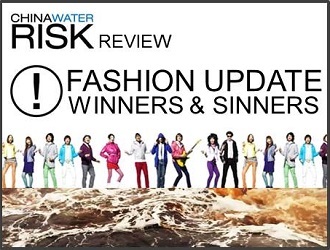 As highlighted in Investors Beware: Blackholes & Blacklists, most might not recognize that brands/investors are exposed to the same water risk regardless of whether they are buying high end or high street fashion as some share the same suppliers. The report makes several recommendations summarized below. Provinces to publish monitoring data – Zhejiang, Shandong and Fujian have already begun doing so. However, the report highlights that a significant obstacle to the execution of these recommendations is the lack of enforcement in the industry (our views on enforcement here). The report touched on the new emission standard that was passed by the Chinese government on 1 January 2013, “Discharge standards of water pollutants for dyeing and finishing of textile industry (GB4287-2012)”, which reduces pollutant discharge value limits. The investigation revealed that many regions have yet to implement the new standard and that of the five primary dyeing and finishing provinces (Zhejiang, Jiangsu, Guangdong, Fujian and Shandong) only two provinces (Zhejiang and Fujian) have implemented the standard. However, within Zhejiang the report says that large scale violations are still occurring. The good news is that there has been movement in water tariffs & pollution the last month from various ministries from Public Security to Finance, Environmental Protection and Water Resource. Separately, the ACEF has filed a high profile lawsuit against PetroChina. With all of these developments, surely the days of bad practices in dyeing and finishing methods are numbered. With much focus on pollution on dye houses, to dye or not to dye becomes the question. There are water friendly dyeing methods that brands can adopt: Birla Cellulose discusses such a technique here and Dupont discusses water use reduction by enzymes here. Recently described by Nike as a “manufacturing revolution” one of its manufacturers installed equipment that it claims eliminates the use of water and process chemicals from fabric dyeing. This month, China Cotton Association China’s cotton output is set to shrink by 504,000 tons in 2013 compared to 2012. Going forward with the expectation of continued unpredictable weather, surely more emphasis needs to be placed on materials sustainability. Corporate Conscience: Beyond Charity Why are so few companies effectively mitigating water risk? Is it time for the conscientious corporate to transition water from purely charity and compliance to a core business activity?